Posted by Jon in Mortal Kombat, Review, Storm Collectibles with 0 comments. Everybody remembers the Mortal Kombat games for their blood, sometimes sweat, and of course the fatalities. But something that gets overlooked quite a bit is how they introduced hidden characters into the fighting game genre. The original game featured a hidden fighter we’ve come to know as Reptile (who Storm is releasing in a month or two). The circumstances required to trigger his fight were kind of crazy: be on the pit stage, don’t use block, a silhouette needs to cross the moon, double flawless, and fatality. The discovery of Reptile led to fan speculation that there could be other hidden warriors in the game, of course there wasn’t. However, when Mortal Kombat 2 hit arcades it was found to have upped the ante with three secret contenders: Smoke, Jade, and the subject of our review Noob Saibot. The name Noob Saibot is a tribute to the creators of Mortal Kombat, Ed Boon and John Tobias. In case you still haven’t figured it out yet, it’s both of their last names spelled backwards. Noob was probably the most straight forward of the hidden character trio to unlock. There were no special circumstances, you just had to have a fifty game win streak (or twenty-five on the Sega Genesis). He uses the same character model and moveset as Scorpion, but he’s entirely black. Eventually Noob became a playable character and was given the backstory that he is the original Sub Zero, who died at the hands of Scorpion during the events of the original Mortal Kombat. I can understand how groan-worthy it is that the first four characters in Storm Collectibles’ Mortal Kombat line are palette-swapped ninjas. Especially after they previewed a Goro prototype years ago that has all but disappeared. But as far as being a San Diego Comic Convention exclusive, Noob Saibot makes a lot of sense. Noob is the type of figure that a completist would likely want to pick up, but most collectors would be inclined to pass on because he’s just a black version of Scorpion. While he comes with Scorpion’s accessories like the masks, hands, skull head, flame effects, and spear, he also has a couple of new parts to sweeten the pot. 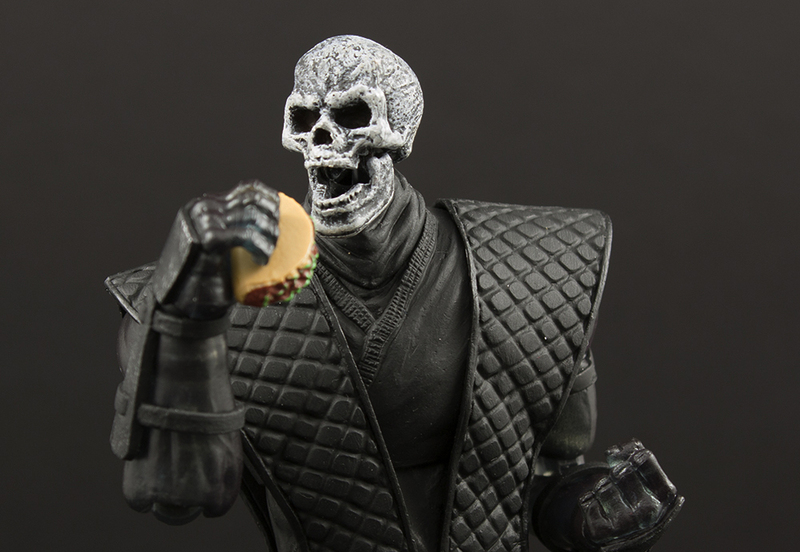 What’s a Mortal Kombat toy line without the ability to play-act the fatalities? Noob includes two blood effect pieces that can plug into the base of the neck and the bottom of the head. So far, all of the characters are from the same mold so these parts work seamlessly with each other. I hope that these effect parts will continue to be compatible with new molds like the upcoming Shao Kahn figure. It appears that both Storm Collectibles SDCC exclusive figures, Hot Ryu and Noob Saibot, were offered post-convention distribution as quite a few online retailers have been selling them. Noob runs about $20-$25 more than the regular releases. The price is a bit of a disappointment, but it’s also kind of expected for a convention exclusive. Would I recommend Storm Collectibles Mortal Kombat Noob Saibot? Yeah, I would. Even at the higher price he’s still a nice chunk of toy with a great “fighter” articulation scheme and a ton of accessories. He also includes those unique blood effects, if you are into that type of thing. If this is your first foray into Storm’s Mortal Kombat line, however, I’d pick up a Scorpion or Sub Zero. Might as well test out the line on a slightly more affordable figure. If you like it and want to go all in, then Noob won’t disappoint either. Noob Saibot is currently available on Amazon.